Helicobacter pylori infects approximately half of the world population and is a major cause of gastritis, peptic ulcer, and gastric cancer. Moreover, this bacterium has quickly developed resistance to all major antibiotics. Recently, we developed a novel liposomal linolenic acid (LipoLLA) formulation, which showed potent bactericidal activity against several clinical isolated antibiotic-resistant strains of H. pylori including both the spiral and coccoid form. In addition, LipoLLA had superior in vivo efficacy compared to the standard triple therapy. 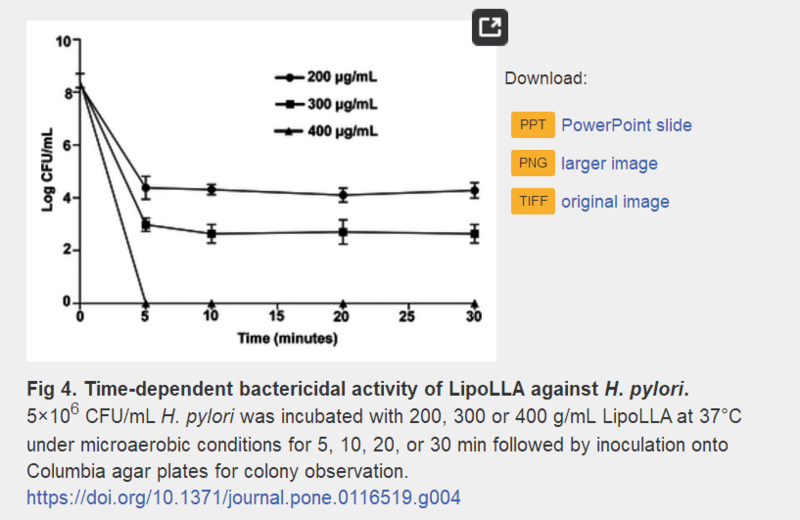 Our data showed that LipoLLA associated with H. pylori cell membrane. 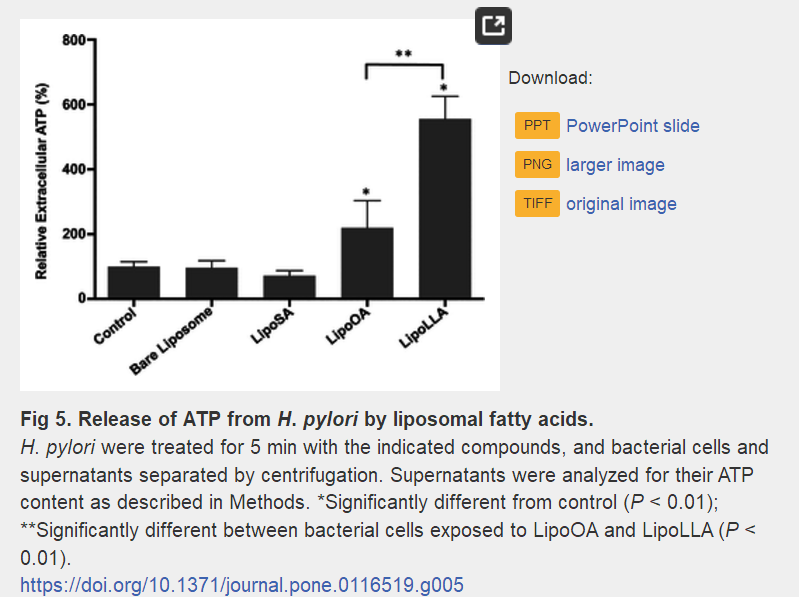 Therefore, in this study, we investigated the possible antibacterial mechanism of LipoLLA against H. pylori. The antibacterial activity of LipoLLA (C18:3) was compared to that of liposomal stearic acid (LipoSA, C18:0) and oleic acid (LipoOA, C18:1). 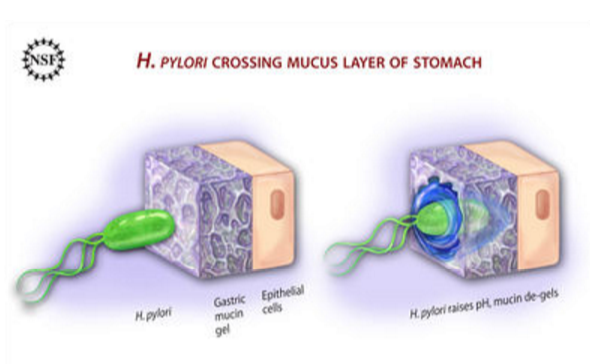 LipoLLA showed the most potent bactericidal effect and completely killed H. pylori within 5 min. The permeability of the outer membrane of H. pylori increased when treated with LipoOA and LipoLLA. 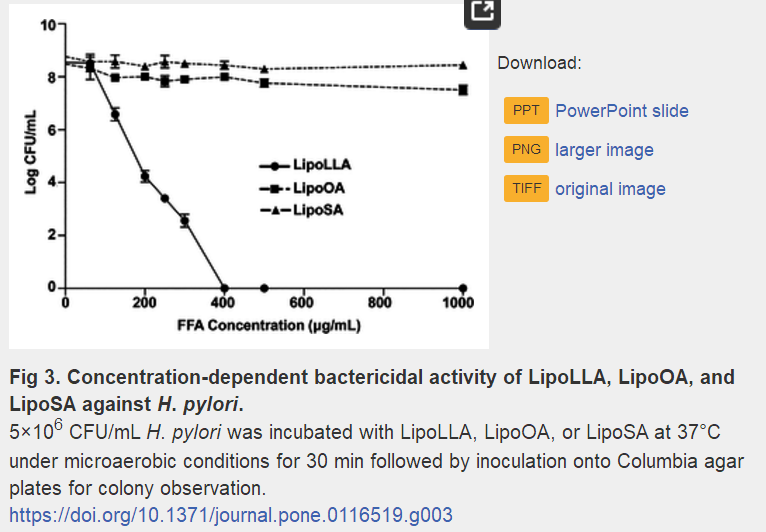 Moreover, by detecting released adenosine triphosphate (ATP) from bacteria, we found that bacterial plasma membrane of H. pylori treated with LipoLLA exhibited significantly higher permeability than those treated with LipoOA, resulting in bacteria cell death. 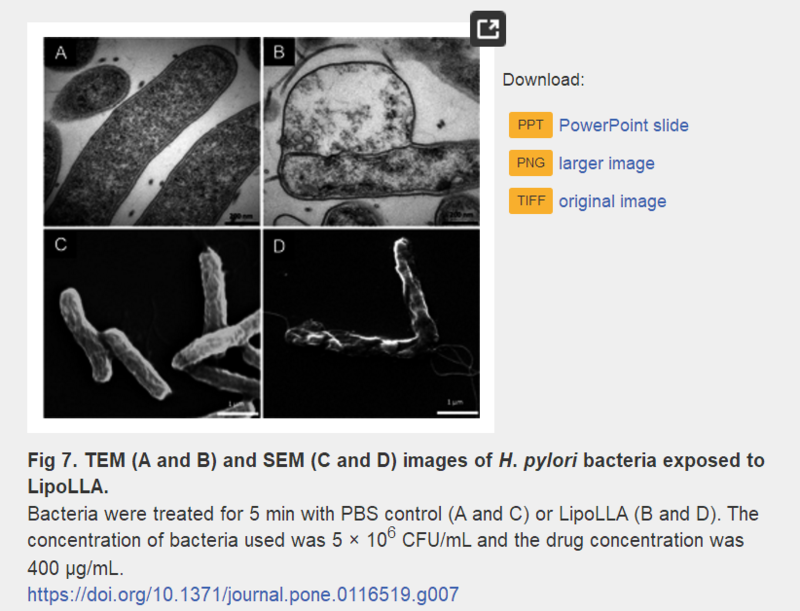 Furthermore, LipoLLA caused structural changes in the bacterial membrane within 5 min affecting membrane integrity and leading to leakage of cytoplasmic contents, observed by both transmission electron microscopy (TEM) and scanning electron microscopy (SEM). Our findings showing rapid bactericidal effect of LipoLLA suggest it is a very promising new, effective anti-H. pylori agent.